There are over 150 bodies of water in Iowa considered big enough to call a lake by most fisherman. Additionally there are ponds, streams and creeks with additional fishing options. We will focus on the larger fishing impoundments here giving size, location and species. Bass, crappie and walleye are the focus of most Iowa anglers yet there are additional anglers with interest in muskellunge, trout, catfish, panfish, northern pike and others. This chart shows the major fishing waters in Iowa, cross referencing these waters with the major types of fishing to be found in each of the lakes or impoundments. For a more complete list of fish species in Iowa, see the list below, which also includes state records. Big Creek Lake is an 830-acre lake in Central Iowa 2 miles northwest of Polk City, IA. Big Spirit Lake is a 5,700-acre lake in northwest Iowa on the Minnesota border, at Spirit Lake, IA. Black Hawk Lake is a 950-acre lake in northwest Iowa 10 miles east of Odebolt, IA. Browns Lake (Bigelow Park) is a 580-acre lake in northwest Iowa 1 mile west of Salix, IA. Brushy Creek Lake is a 690-acre lake in north-central Iowa 3 miles northeast of Lehigh, IA. Clear Lake is a 3,700-acre lake in north-central Iowa at Clear Lake, IA. Coralville Lake is a 5,300-acre lake in east-central Iowa 1 mile northeast of North Liberty. DeSoto Lake, aka DeSoto Bend Lake, is a 790-acre lake in west-central Iowa 4 miles west of Missouri Valley, IA. East Okoboji Lake is an 1,800-acre lake in northwest Iowa at Okoboji, IA. Five Island Lake is a 950-acre lake in northwest Iowa at Emmestburg, IA. Lake Icaria is a 670-acre reservoir in southwest Iowa 2 miles east of Carbon, IA. Lake MacBride is an 810-acre lake in east-central Iowa, 2 miles northeast of North Liberty, IA. Lake Manawa is a 710-acre lake in west-central Iowa on the southern outskirts of Council Bluffs, IA. Lake Red Rock is a 15,200-acre lake in central Iowa 3 miles west of Pella, IA. Little River Lake is a 780-acre lake in south-central Iowa 1 mile northeast of Decatur City, IA. Little Spirit Lake is a 610-acre lake in northwest Iowa on the Minnesota border, at Spirit Lake, IA. Lost Grove Lake is a 1,700-acre reservoir in eastern Iowa, at Eldridge. Lost Island Lake is a 1,260-acre lake in northwest Iowa 2 miles north of Ruthven, IA. North Twin Lake is a 450-acre lake in northwest Iowa 5 miles south of Pomeroy, IA. Okamanpeedan Lake, aka Tuttle Lake, is a 2,360-acre lake in northwest Iowa, 1 mile north of Doliver. Pleasant Creek Lake is a 400-acre lake in east-central Iowa 3 miles north of Palo, IA. Rathbun Lake is a 11,000-acre lake in south-central Iowa 1 mile north of Rathbun, IA. Rock Creek Lake is a 490-acre lake in central Iowa 2 miles northeast of Kellog, IA. Saylorville Lake is a 5,400-acre lake in central Iowa at Polk City, IA. Silver Lake (Palo Alto) is a 1,000-acre lake in northwest Iowa 1 mile west of Ayrshire, IA. Storm Lake is a 3,200-acre lake in northwest Iowa at Storm Lake, IA. Three Mile Reservoir is an 880-acre lake in south-central Iowa 7 miles northeast of Creston, IA. Trumbull Lake is a 1,180-acre lake in northwest Iowa 2 miles north of Ruthven, IA. Twelve Mile Creek Lake is a 630-acre lake in south-central Iowa 7 miles northeast of Creston, IA. West Okoboji Lake is a 3,850-acre lake in northwest Iowa at Okoboji, IA. Find fishing regulations and information about fishing in Iowa at the Iowa Department of Natural Resources website. Visit AA-Boats-Boating.com to find information about fishing boats in Iowa and other boating information. 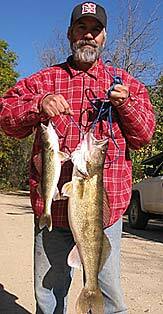 Get your Iowa Fishing License here. Excellent largemouth bass and smallmouth bass fishing opportunities are available to anglers in IA.